The personal Calendar of Hyper, is an unique tool for managing the users schedule, that allows its users to view each others schedule, according to their Authorizations. One of this tool's advantages is its automatic updating and synchronization with any change and update made in any of the employees schedule. This ability allows effective planning of meetings and tasks, while considering the schedule of the rest of the employees and managers. Also, this tool provides an easy and Immediate access to the Hyper cards of clients and suppliers that are mentioned in the calendar. 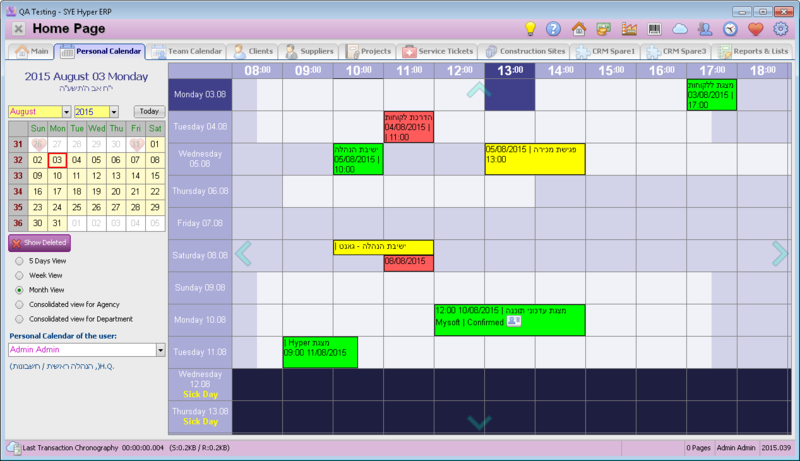 The personal calendar is adjusted to the needs of any company or organization and to any of its employees and managers. This is a very important and useful tool for tracking and recording the employees activity and for the coordination of the entire organization activity. White - The shift time of the employee. Purple - The pointed time square. Dark Purple - Sick Day / Vacation Day. Personal Calendar of the user - This field allows to view the personal calendar of any of the employees and managers on the list, according to the defined authorizations in the users employee card. If the user chooses the "Consolidated view for Agency" or "Consolidated view for Department", then the required agency or department should be chosen from the list in this field. Show the deleted meetings (Canceled). The deleted meetings will be presented as long as this button is active. The calendar system is very simple and can be easily operated. Double click on the required time square. Fill in the relevant fields. Choose the required attendees and recipients by using the Add Recipients (F5) button. Please note - As default, an invitation will be sent to any of the attendees and recipients, as long as the Send invitations via Email button is active. Click on this button if you wish to cancel the automatic sending. Click on the required meeting square.